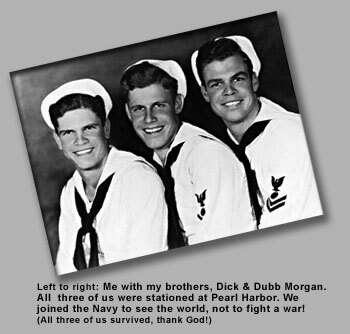 I am Joe Morgan, a survivor of the Japanese attack on Pearl Harbor, December 7th, 1941. I was an aviation ordnanceman third class in Aircraft Utility Squadron Two (VJ-2) stationed on Ford Island that infamous morning. VJ-2 was housed in a hangar on the Southwestern shore of Ford Island which is in the middle of Pearl Harbor. I was just a young sailor from Little River, Texas, who had joined the Navy to see the world. I certainly was not expecting to have to fight a war! until there was a loud explosion across the runway Southeast of us.